Amar Jyothi released in 1936 was produced by Prabhat Films and directed by V. Shantaram. Music by Master Krishna Rao. An adventurous classic film in which injustice towards women comes a theme. A woman denied with the legal custody of her son becoming a revolutionary and turning to a sea pirate. Durga Khote’s excellent performance as the pirate queen. Sword fights, scenes in the sea and ship – well shot using technology available those days. Shanta Apte sang memorable songs. Chandra Mohan as the villain did his best in the film. Huge hit at the box office. 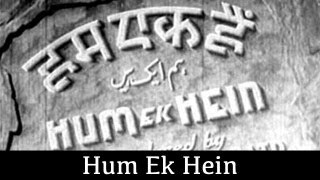 Songs like “Suno Suno Ban Ke Prani…”by Shanta Apte, “Aaj Hamem Ban…” duet by Shanta Apte and Nandrekar still remain favourites among old numbers. The title song which continues as a chorus in the ship was well picturised – Shantaram’s classic number.